They open up with My Angel Wears White, a powerful melodic rocker. The opener is combining a memorable riff with great hooks. The backing vocals are a bit 80's like... For this one they got a helping hand from Tommy Denander. Samurai is next in line and they add some Asian sounding elements. Again it's Kronlund's guitar play which first demands your attention, then Mr. Reece joins in and it's his voice which will enchant you. At the balladesque Could This Be Madness Mr. Reece sounds a bit like David Coverdale... But it's not just the vocals, the keyboard's partly supporting this impression. For Animals And Cannibals they speed up, a fast rocker based on razor-sharp riffing and offers an anthem-like chorus. This time Christian Tolle joined them for a song and it's a song to party. Live this one would be killer! After a slower tune they speed up again and rock with Paint The Mirror Black, a catchy rocker with a memorable riff. Another slow tune is I Would, a solid track which back in the late 80's would surely got a lot attention. At Edge Of Heaven Andy Susemihl plays guitar, no surprise as he was part of Reece's solo album Universal Language. The opening keyboard is a bit 80's like, but it's the guitar play which sticks out. Only the chorus is a bit repetitive... Magic Pudding - what a song title! - is built on a cool riff and again it has a slight Whitesnake-appeal. They close the chapter with The Dead Shall Walk The Earth, a fast track with sharp riffs and an 80's feel... But this time it isn't a hard rock tune, more NWoBHM... Vocally a bit like Maiden with Dickinson while the riffing is more Priest-ish... But all that doesn't matter, coz it's a great tune and a real neckbreaker! Time for some head banging! Sure, this isn't something ground-breaking new, but it's a more than solid album of the dynamic duo. Perhaps not every track is on the same high level, but there aren't any fillers. 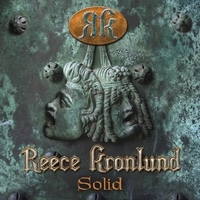 Check out Reece Kronlund!